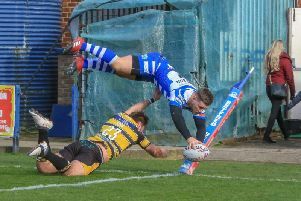 Halifax’s crisis of form and confidence took another turn for the worse as they lost out 24-22 to Dewsbury Rams at the Shay in the Championship Shield. In a game that rarely managed to rise above the mediocre, Richard Marshall’s side - who have now lost six games on the bounce - led 6-0 and 16-10 before being overhauled by Glenn Morrison’s Rams, who owed their success to two second half touchdowns and some desperate last ditch defence. Neither side was in sizzling form from the kick off, but it was Halifax who took a tenth-minute lead when full back Miles Greenwood slipped over in the corner after a long run from the Australian prop Mitch Cahalane. Young centre Nick Rawsthorne kicked the conversion for a 6-0 lead, but it was the Rams who moved ahead with two tries either side of the 20 minute mark. Centre Etu Uaisele got the first with a powerful charge to the right corner, with half back Andy Kain picking off a 60 metre interception a couple of minutes later and Paul Sykes kicking the Rams into a 10-6 lead. The home side regained a slender advantage just past the half hour when captain Scott Murrell kicked ahead and regathered the rebound off the post to score, Rawsthorne’s kick making it 12-10. And they moved 16-10 ahead at the interval when back rower Dane Manning scored on the left from Gareth Moore’s short pass. Dewsbury regained the lead after half time through a simple try from Tony Tonks, converted by Tom Hemingway, and then went ahead through Uaisele’s second, although there was some doubt about both the touchdown and Hemingway’s conversion, which was given by one touch judge but not the other. Leading 22-16, the Rams then established an eight point lead through a Hemingway penalty to go 24-16 ahead with 25 minutes remaining. Halifax closed to within two points at 24-22 when Jacob Fairbank stepped through under the posts, Rawsthorne converting, but despite plenty of late pressure that was as close as they got.